The Division One 5th place playoff with the two mid table sides – each having won 2 and lost 2 – perhaps the prediction might be a drawn match. The Brits two losses were to Canada and Ireland while wins achieved over South Africa and Fiji. The Nauru Chiefs ran into the brick wall of the NZ Hawks on day 1 and subsequently scored wins over Canada and France while falling short against PNG after a horrible first quarter at Sebastopol in Ballarat. The Brits take in the height advantage while the Chiefs prefer to open out the play and use the ball with precision both by hand and foot. 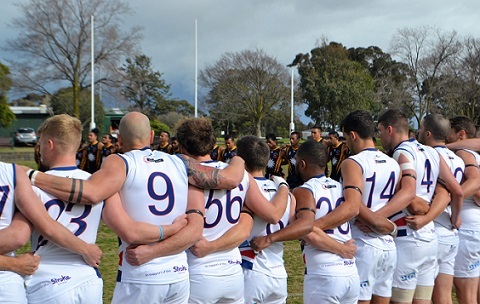 The weather would play it’s part in this game – as the first half was played in real wintry Melbourne conditions. Suddenly at half time – out came the sun. The wind though – was a constant. This was a hard and physical game that saw the Chiefs have to work overtime to finally kick clear after half time - the Brits at the main break could taste a defining victory but in the end - it went the way that these contests have in the past. 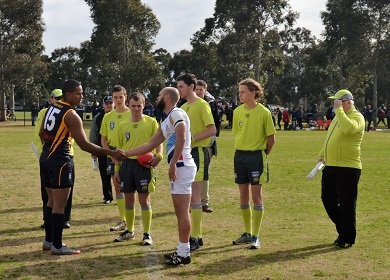 Nauru won the toss and elected to kick to the city or Southern end of McAlister Oval. The wind advantage all day hasn’t been as great as might be thought as the wind was mostly across the ground with the odd change of direction swirl to complicate matters. Before the bounce there had already been a couple of heavy showers – no hail – that was reserved for a few suburbs a little to the North. The Chiefs were attacking early but the Great Britain defensive structures were holding out. Time after time the Brits defended the D50 but broke down trying to transition into attack. Nauru on the other hand just couldn’t spot up the forward targets. Despite the dampness – although the showers had passed – the Chiefs were playing their high possession game, controlling the ball, but it didn’t always work. Trying to switch across the defensive goals – it came unstuck via the efforts of Britton (#8) for the Bulldogs. Soon after the busy Cochran (#4) slammed the ball forward – a little agriculturally but never the less it found key goal kicker Andrew Walkden (#17) who ran onto the ball and snapped truly on his right for. Not long later it was David Hastie (#22) who was making himself busy – adding a second after Cochran’s good work in the last line of defence that started a length of the ground transition. 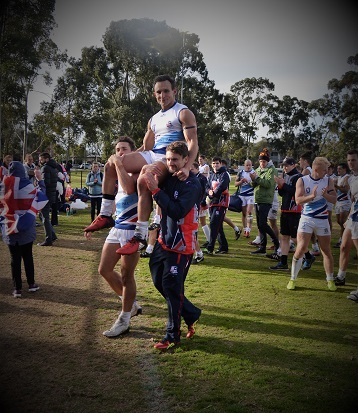 Alas though – Jason Hill (#16) had taken a heavy knock in the marking contest and was down and out. The game was heating up – the challenge had been laid down and the Chiefs lifted. Forward forays resulted first in behinds, when Yoshi Harris (#28) marked and from CHF pulled his kick it was the skipper Trent Depaune (#15) who marked but went near side of the post from a tight angle. The next snap from a stoppage by Dagiaro (#17) was touched off the boot. But Nauru were surging even as time was running out for the quarter. It was a tackle by Deidenang (#19) on GB defender Adam Coxsell (#56) that resulted in the first goal from the free kick. The Chiefs had started Jeremiah (#13) in the ruck against tall Brit Alex Watson (#13) – now young Tatum (#24) was back in the centre – and this time he did his own roving to set up a clearance then via Kenneth Oppenheimer (#11) working hard to keep the ball alive – his delivery forward end with Daniel (#23) who snapped a ripper from the right half forward boundary – with seconds to spare – suddenly the Chiefs had claimed the quarter time lead and it was game on in a highly entertaining contest. However – the rain was back. The damp second quarter became a war of attrition. This game was for keeps. 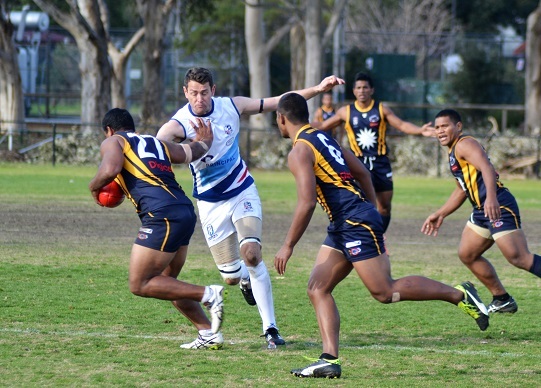 Great Britain would dearly love to claim the IC scalp of the Nauru Chiefs. The first goal of the term though the sure skills of Oppenheimer who snapped truly at the Brunswick end. The Brits replied – a free to the 200cm Ryan Floyd resulted in a goal and it was back to a 2 point ball game. The wet weather was a challenge for the two styles of play. The Brits with taller targets were generally a little more kick, mark, kick, mark while the Chiefs knew they had to avoid just kicking to packs and so were employing a high possession game, willing to hand ball backwards to set up cleaning delivery to free targets – especially coming out of the backline where they were getting numbers back. Going forward though the Chiefs were still struggling to hit their targets where the British defenders were reading the play well or just benefitting from some poor delivery. Mid quarter the game was held up when after a marking contest in front of the Bulldogs goal – that resulted in a behind – eyes were drawn to the British player left lying on the ground. Marc Cashman (#9) had to be assisted by trainers to first sit up and then make his way from the ground. The Brits small forward Kadnapillai (#26) was the beneficiary of a free kick for shepherding in the marking contest – in front of goal – and went back with no troubles to regain the lead. The resultant centre bounce saw another Bulldog come undone – chasing the bouncing ball Britians George Dibble (#19) was met heavily but fairly by Charles Dagiaro (#17) and with a shoulder injury the result – Dibble immediately took himself to the bench and his afternoon was over. Despite the carnage – the Brits were on top late – and competition leading goal scorer Walkden was looking likely late in the quarter. 1 more behind was the extent of it though – so half time, a 6 pt margin in favour of the Brits. Across half time the weather changed – some blue sky appeared from the south and shortly after the sun was again revealed. Bathed in sunlight - the third term – the ‘premiership quarter’ – very much turned out that way. Early on it looked like a continuation of the ebbs and flows of a titanic struggle. 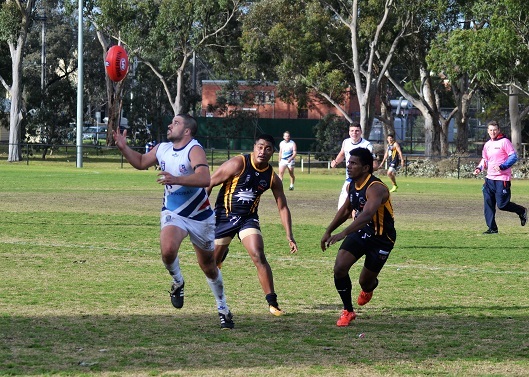 Nauru levelled the scores early via a clever snap from the left forward pocket by Joeson Kanimea (#25). The Brits were under pressure when Bronco Deidenang (#19) bullocked his way into a small piece of space to slam through another one to give the Chiefs the outright lead again. The Brits weren’t done with – and after a wayward snap on goal by Hastie (#22), the ball spilled free to Andrew Cochran (#4) who snapped the goal to again level the scores. The game had gone up a notch again – could the Brits sustain it – unfortunately when Ross Denton (#7) was called for taking the legs which delivered a shot on goal which went wide but from the scrimmaging mayhem that resulted it was Richmond Spanner (#20) who forged a path to goal and the Chiefs were back out by a goal. When again the classy Oppenheimer sent the Chiefs forward, the mark to Daniel (#23) plus 25m against Coxsell on the mark – and a simple goal from the square – Nauru out by 12 points and suddenly the tiring Brits – a couple of men down on the bench – were looking about spent. The needed spark after a reward tackle – the free kick from the big fella Floyd for the Brits – 35m out directly in front – tired legs – fell short, the Chiefs cleared. A late goal there might have given the Brits the energy to go on.